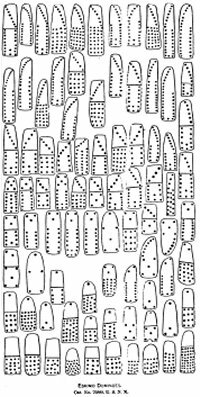 "The Inuit, who come from the western end of Hudson Strait, the so-called Northerners, have a game which they play with sets of pieces of ivory cut into irregular shapes, and marked on one face with spots arranged in different patterns. The number of pieces in a set varies from 60 to 148. The name of a set is ma zú a lát, and somewhat resembles our game of dominoes. The game is played in the following manner: Two or more persons, according to the number of pieces in the set, sit down and pile the pieces before them. One of the players mixes the pieces together in plain view of the others. When this is done he calls them to take the pieces. Each person endeavors to obtain a half or third of the number, if there be two or three players, the one who mixed up the pieces lays down a piece and calls his opponent to match it with a piece having a similar design. If this cannot be done by any of the players the first has to match it, and the game continues until one of the players has exhausted all of the pieces taken by him. The pieces are designated by pairs, having names such as ka míá tik (sled), kaiak (canoe), kalé sak (navel), ma zut (many), a taú sik (1), má kok (2), ping a sut (3), si tá mút (4), and tá li mat (5). Each of the names above must be matched with a piece of similar kind, although the other end of the piece may be of a different design. A kamutik may be matched with an amazut, it the latter has not a line or bar cut across it; if it has a bar it must be matched with in amazut. This game is known to the people of the Ungava district, but those only who learn it from the Northerners are able to play it. The northern Eskimo stake the last article they possess on the issue of the game. Their wives are disposed of temporarily, and often are totally relinquished to the victor. I have heard of wives so disposed of, often sit down and win themselves back to their former owners." Dr. Franz Boas informs me that the Eskimo name for dominoes means "standing upright side by side." Notes: 1. Eleventh Annual Report of the Bureau of Ethnology, 1889-90, pp. 257-258.